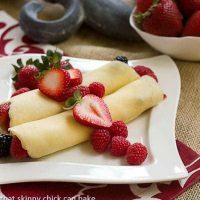 These Brown Butter Crêpes with Berry and Cheesecake Filling make a sublime dessert or a most decadent dessert! You decide. In a saucepan, cook the butter over medium heat, swirling it every few seconds, until melted and golden brown, 2 to 4 minutes. Let cool to room temperature. Combine the milk, eggs, and salt in a blender. Blend till mixed, then add the flour and blend until very smooth. Add the brown butter and blend for a few more seconds. Allow the batter to rest at least 5 minutes and up to one day (refrigerate if not using immediately). Batter should thicken but not be as thick as regular pancake batter. Thin as needed after resting period. Heat a crêpe pan or nonstick skillet over medium high heat. Grease with a little butter on a paper towel. Pour about 1/4 cup of the batter into the center of the pan while tilting and turning it till a thin circle of batter covers most of the surface of the pan. Cook till the edges begin to dry and lift from the sides of the pan and the bottom browns, about 1 minute. Flip using a spatula or your fingers, and cook until the second side is browned, about 20 seconds more.Remove from pan and repeat with the remaining batter, adding more butter as needed. To make filling beat cream cheese, powdered sugar, lemon juice, zest and vanilla. In another bowl, whip cream. Carefully mix together. Place spoonfuls of filling along center of crepe and arrange berries over cream. Roll up and garnish with berries. Serve immediately.